The Yinchorri were a reptilian species from the planet Yinchorr divided into two castes: a ruling caste of intelligentsia, and a highly aggressive warrior caste. They were highly resistant to mental manipulation through the Force. Yinchorri culture was best summarized in the expression "might makes right," and that anything they were capable of taking and holding by force was rightfully theirs. They were led by a Council of Elders. 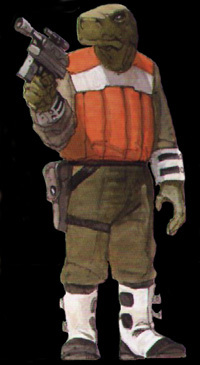 475 years before the Battle of Yavin, Yinchorr was first charted by the Galactic Republic. 58 years before the Battle of Yavin, the Yinchorri became full members of the Galactic Republic and gained representation in the Galactic Senate. They then began to acquire high-technology items such as hyperdrive-equipped spacecraft, advanced weaponry, and lightsaber-blocking cortosis shields. 33 years before the Battle of Yavin, the Yinchorri used their new weapons to attack neighboring settlements, including Mayvitch 7, a moon of Amador in the Chalenor system. This conflict, later known as the Yinchorri Uprising, was secretly provoked by Darth Sidious. A Jedi task force, led by Mace Windu and including Qui-Gon Jinn and Obi-Wan Kenobi was sent to the Yinchorri system to negotiate, but encountered only hostility. As a result of their actions, a heavy military garrison was placed on the planet. Later, during Emperor Palpatine's reign over the Galaxy, the Imperial Governor Marcellin Wessel held the Yinchorri Council of Elders hostage: in exchange for the Council's release, the Yinchorri attempted to deliver Leia Organa captive to the Empire. In the end, the Empire slaughtered the Council, and the Yinchorri rebelled. As a result, the Empire devastated the world, destroying its main city, Tol Kashorn. Palpatine had the Imperial Royal Guard Academy set up on this distant, devastated world. The harsh desert world made it ideal for the training of these elite guards. After the planet was liberated by the New Republic, the Yinchorri began to rebuild their society, but chose to remain independent from the New Republic.